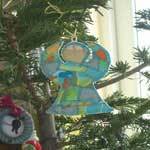 Make a Christmas angel for your tree or to add to wrapping on a present. 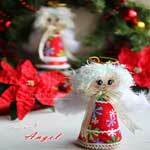 You will also find angel ornament patterns to sew. 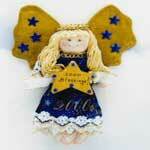 This glittery angel has blonde hair, a halo, golden wings with blue stars and a beautiful blue dress, plus she is holding a star with the year written on it. Strip quilting is required when making this heavenly angel with long flowing hair and a golden halo. 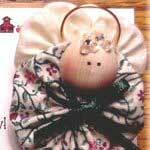 It's so easy to make several of these adorable yoyos to hang on the tree, embellish a Christmas gift or wear on your clothing. 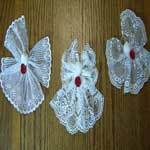 Using white lace, pom pom, gold thread and a few other materials you can make these heavenly lace angels. 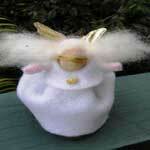 Make several of these adorable angels to hang on the tree each with white hair and a sweet and precious little face. Create the look of stain glass with zig-zag patch working by following these step by step instructions. 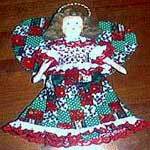 Create a beautiful angel using felt fabric in white and other colors to create a warm and welcoming Christmas spirit in your home this year. 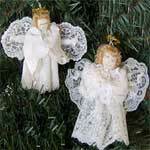 All in white lace and with golden hair these precious ornaments look like they are straight from heaven.